Melissa Etheridge is a two-time Grammy winner, a multi-platinum recording artist, and a mom. But in 2004, she added a title that might mean more to her than any other: breast cancer survivor. 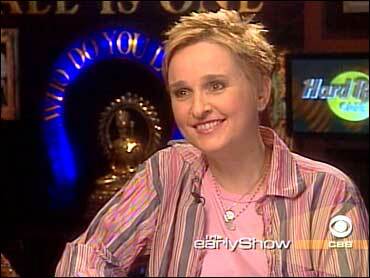 The following is The Early Show co-anchor Rene Syler's interview with Etheridge. In some ways, these are the best of times for Melissa Etheridge: a new album, a new cause, and a fresh outlook that comes from surviving a disease that took her completely by surprise. "My world stopped, which it had never done," she said. "I've worked since I was 11 years old, playing music and following the dream, and shaking and moving and doing it. And then, you have cancer and it was like 'Ooooohh.' It was like a big eraser. It was the only thing in my life that had ever made me just stop." Did she ever feel like she was going to die? "No!" she said. "When I found the lump and thought it could be that c-word and then the doctor called and said cancer and I said "oh." After her diagnosis last October, Etheridge, along with her two children and Tammy Lynn Michaels, whom she married a year earlier, disappeared from view while she underwent treatment. "I'm very fortunate that I have a wonderful family around me and loved ones," she said. "I'm also fortunate because, financially, I could make myself comfortable at that time. I know there are millions of women who can't and I would lay there thinking of the women who would have to go to work on chemotherapy, and it just blows my mind. "Of course I thought about myself, poor me, poor me. But I also thought about the millions who were going through this." She endured months of chemo and radiation. But by Valentine's Day, Etheridge was ready to re-enter the world. This year's Grammy telecast in February was her coming out party. And she belted out a tribute to Janis Joplin that was easily the most electrifying moment of the night. She had no hair, no eyebrows, no eyelashes, but she sang her heart out. "What people don't get is that hair is such a big part of our identity," Etheridge said. "And I was a rocker very attached to my hair. I used to get up on stage and I used to (she shakes her head) and it's not there. I used to hide behind it. It was a big thing for me to come out like that. But it was very empowering. It felt great. "No one can tell but I was holding back on the second verse because there's a scream at the end. I knew I just needed to relax into it, but it was fine." Etheridge has just released a new album, "Greatest Hits: The Road Less Traveled." But there's another project that is, literally, close to her heart: a lapel pin for breast cancer awareness that she helped design. "Hard Rock is donating 100 percent of the proceeds to the Susan Love Foundation," Etheridge said. "What's so great about Susan Love is that they're not looking for a pill to cure cancer; they're looking to prevent cancer. They're looking for the pap-smear, for breast cancer, to get it before it's gone too far." Etheridge says she's now cancer free, but out of her ordeal has come inspiration: one of her most recent songs is a tribute to the people who run to find a cure. I run for your mother, your sister, your wife. I run for you and me, my friend. I run for life." It pretty much says it all. "I hope so," Etheridge said. Click here to purchase her pin.